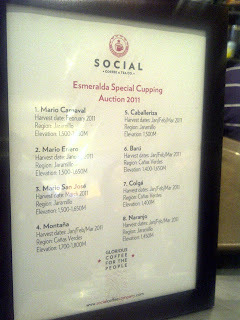 This past weekend, Social Coffee Co held a special cupping session at Manic. The quickest and most trusted source: Twitter informed me that @Socialcoffeeco would be heading down for 4PM amd it only seemed like a no-brainer to get in on this action. The weather was amazing this past weekend, so that meant pumping up the tires and go for a spin, to warm up the mind, body and soul.... or just my tastebuds for what would be a great experience. For starters: Esmeralda Farm in Panama, is home to the only location for the Geisha Bean.. It's travelled from Ethiopia-Kenya -Tanzania crossing the ocean to Costa Rica and now it's located in Panama. The origin of the bean, might give you a hint of flavours, yet the beans speak for themselves. We were privy to trying the 8 different lots located on this same farm. With this consistency we were able to compare the same bean roasted at the same level. The buzz surrounding the Geisha beans, since there is only one location that houses these beans, the farm can start a bidding war. 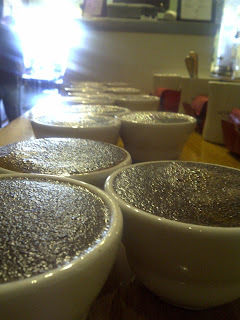 Let's get an update of the players in this special cupping. 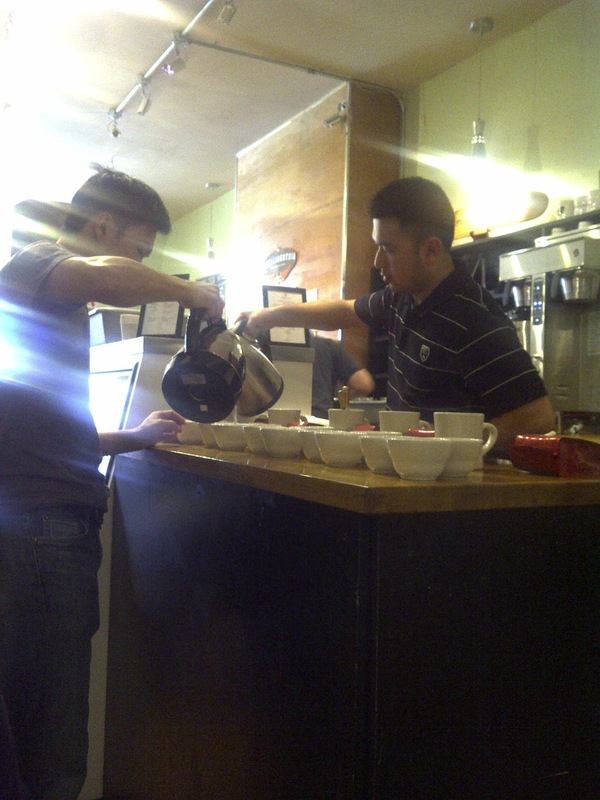 They come from either Jaramillo, or the Canas Verdes region. Verdict: Huge Floral notes, with clean bodies, and pleasant lingering mouthfeels. Peach, stone fruit really comes out. 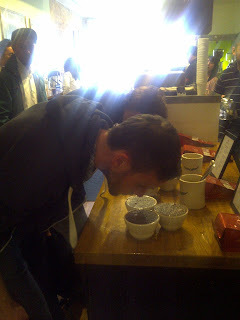 Steve, Social, decided to break the cupping into 2 flights. 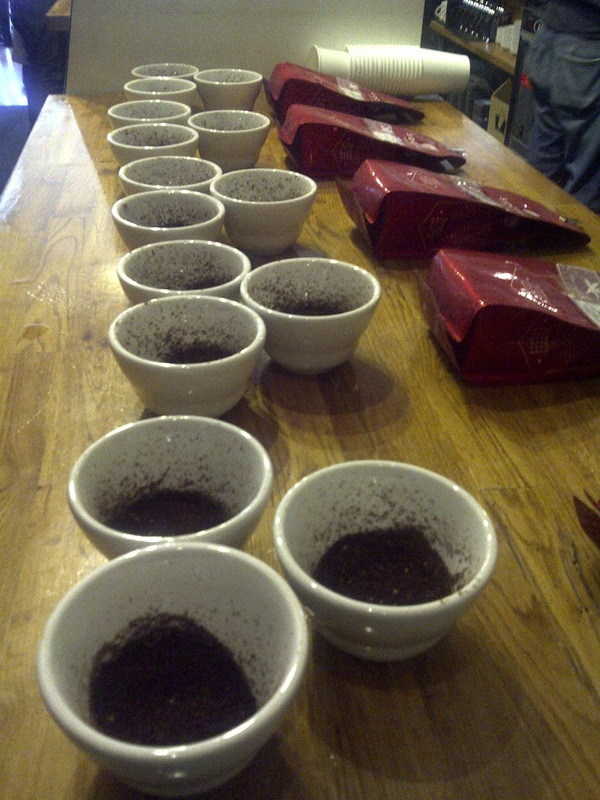 followed by trying the higher lots 1-4. Auction lot 1: just had amazing qualities, where the coffee start ed to shine as the temperature dropped. Delicious floral, citrus/orange were ooozing from this cup. Really hopes that someone in Toronto will pick up some auction lot activity at the end of May.